Claudia Wieser, Untitled, 2017, mirror-polished stainless steel and ceramic on MDF, 61 x 60 1/2 x 60 1/2". For her exhibition “Chapter,” Claudia Wieser creates a harmonious environment incorporating elements of cultural history and abstraction. The show includes images of classical busts, hand-painted vases placed on the floor and atop plinths of various heights, and delicate, vivid geometric drawings. Wieser also sourced black-and-white images from the BBC’s 1976 television adaptation of Robert Graves’s novel I, Claudius (1934) for a wallpaper that covers three of the gallery’s walls from floor to ceiling (all works Untitled, 2017). The artist transforms the space into a site of aesthetic examination, meshing antiquity with modern design. Mosaiclike sculptures of metal and ceramic echo the figurative images in the wallpaper. For instance, the stainless-steel semicircles of one sculpture imitate the curlicues of a lyre; another work’s contours mimic the curvature of a statue’s nose. 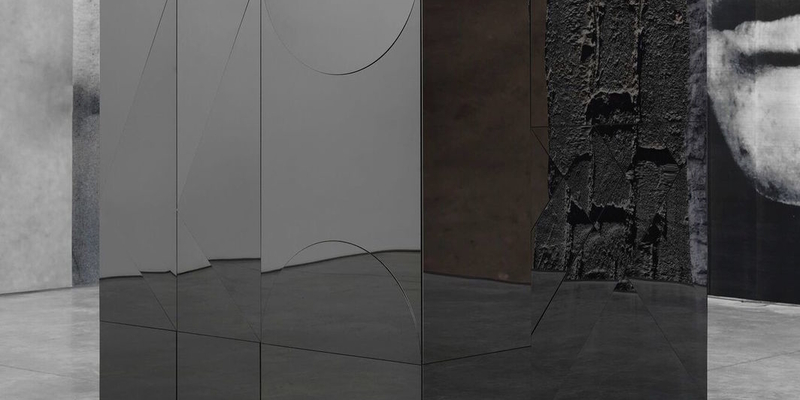 The metallic pieces, made up of simple shapes in rectangular compositions, provide warped reflections of the gallery and, of course, the viewer. A mirror-polished altar in the center of the gallery, a dark and ominous thing that feels like an enormous block of hematite, does the same. Another plinth, decorated with brightly hued tiles and carrying more than twenty colorful vessels, is kaleidoscopic. Wieser’s exhibition weaves sundry narratives—fictive, biographical, historical—into a setting that functions like a stage, forcing the observer to consider her place in time at the center of a great human drama that unfolds endlessly and relentlessly.